Turkey has identified eight out of 15 suspects linked to the missing Saudi journalist Jamal Khashoggi, state-run Anadolu Agency reported Wednesday. 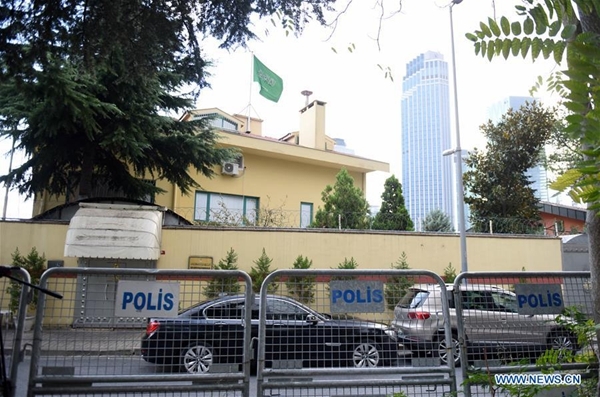 A total of 15 Saudis entered the consulate in Istanbul while Khashoggi was inside, Anadolu quoted security sources as saying. The Turkish police has released the detailed information of the eight Saudi suspects, including several officials. State-run broadcaster TRT aired the footage showing these 15 Saudis arriving by private jet and then leaving a hotel. The Saudi Arabian journalist has been missing since Oct. 2 after entering the Saudi consulate building to get documents for his re-marriage to a Turkish woman. Unconfirmed reports said Khashoggi was likely killed inside the compound, which was denied by Saudi officials as "baseless." A dar earlier, Saudi Arabia invited Turkish experts and officials to visit the consulate after Turkey demanded to search the building. Turkey has identified eight out of 15 suspects linked to the missing Saudi journalist Jamal Khashoggi.